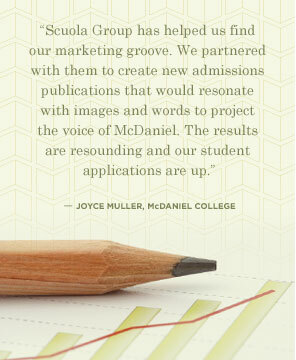 Scuola Group focuses exclusively on the marketing and design needs of clients in the academic and aesthetic realms. We work closely with organizations such as colleges, universities, research institutes, secondary schools, architectural firms, museums, and arts organizations to identify objectives and outline a communication strategy. We then put our targeted expertise to work to develop logo and identification packages, recruiting catalogs, fundraising campaigns, branding programs, and other marketing materials that deliver measurable results. As the daughter of a college professor and a former staff member at her college alma mater, Tina has experienced the academic world from almost every angle. She began her college career at the University of Vermont, where she completed her undergraduate work in 1976. She then went on to the prestigious Parsons School of Design in New York City. With her formal schooling behind her, Tina’s education then turned to real-world lessons learned while working as a freelance designer in Manhattan. She eventually returned to Vermont, where she worked with several different design firms as well as the PR department of the University of Vermont before establishing her own company, Christensen Design, in 1994. “Scuola,” Italian for school, became part of the company’s name in 2006, reflecting both the firm’s heightened focus on the educational arena and Tina’s passion for the Italian language and culture. Steve, an honors graduate from RIT, has been with Scuola Group since 1999. And since that time, he’s worked so closely with our clients that many have come to think of Steve as an integral part of their own marketing team. Not only does Steve create cleanly designed, engaging marketing materials, but he also facilitates an ongoing dialogue with the client to ensure that each piece efficiently communicates the organization’s key points and effectively supports its branding objectives. Steve enjoys the wide variety of design work that Scuola Group attracts, but he has a special affinity for branding and I.D. projects and all the key components that contribute to successful brand building. In addition to his talent as a marketing design professional, Steve is also a fine artist with an avid interest in architectural and interior design. After growing up in Japan, Candy attended Colorado State University, where she graduated with a Bachelor of Fine Arts in Graphic Design and a minor in Art History. With extensive experience in both the newspaper and magazine sectors, she welcomed the opportunity to expand her repertoire as the newest member of Scuola Group. While Candy relishes all aspects of the creative process, her true passion lies in typography — the art of finessing type to enhance the overall effectiveness of a piece. She also enjoys the in-house challenges of producing smart, innovate materials that help increase brand awareness and bring about tangible results — whether it’s logos, identity programs, catalogs, or marketing campaigns. In her free time, Candy can be found exploring Vermont’s Green Mountains or working on her newest piece of pottery.